Ann Coulter’s historical revisionism now extends to redefining what it means to be an American. Using a barrage of statistics (some real, some fabricated), coupled with heart-wrenching anecdotal evidence, fanciful narrative, and a passionate zeal for her nativist perspective, Coulter is rewriting our past with an intent to change our future. Recently, Coulter has defamed whole groups of people, calling them “phony” – from the Tea Party to Christian missionaries. She has a long history of making such false accusations. Now, Coulter is targeting yet another group – immigrants – and doing so with a redefinition of (and conflation of) terms, all to advance her own agenda. Coulter’s jaundiced view of American citizenship was on full display in her column, posted yesterday, in which she again dismisses the terrorist threat in America and confuses the immigration issue by conflating various groups as if they were identical. In addressing crime by immigrants, Coulter lumps everyone in together: immigrants (illegal, legal, second generation, anchor babies) and “citizens” (in air quotes, so that we might know she regards them as not really citizens). Does Coulter regard the current governor of South Carolina as an air-quote citizen? Seemingly. Coulter actually called the native-born governor an ignorant immigrant. Coulter smeared Gov. Nikki Haley (R-SC) – an American citizen – for having immigrant parents, suggesting she was somehow less than a real American. Why? Because this successful governor – who is a native South Carolinian to boot – was from the wrong race! Haley’s family hails from India, not England. Remember, Coulter calls many native-born Americans “immigrants,” not citizens. An idea – liberty and equality – gave birth to America. America – An Idea or a Race? Yes, Coulter contends that America’s greatness stems from having the correct racial composition (i.e., white, specifically British) and that her decline is a result of the wrong racial composition (i.e., non-white, non-European). If that were really true, Britannia would still rule the waves. Coulter insists, “American culture is WASP culture.” But for Coulter, the most important component of that acronym is the beginning: White. Coulter’s almost inalterable emphasis is on race. Yes, white western Europeans created America – an America based on an idea, premised on a proposition, with the purpose of being a shining city on a hill and the last, best hope of mankind. But for Coulter, American culture remains white culture. Coulter speaks of WASP culture in almost exclusively racial terms, emphasizing the first word and giving lip service to the last. But Coulter gives short shrift to the spiritual (Christian) origins of America. As with everything she cares about, Coulter wants to be in charge. She foisted Romney on the nation in 2012 and wants to do so again. She insists that only governors or senators should be nominated. She wants to decide everything. So, too, with immigration. Coulter has a very narrow, unidimensional perspective, shallow and superficial – literally skin deep. Don’t take my word for it. Consider Coulter’s very own criteria for determining whom to let into America. Quite a different outlook from that of Coulter. Coulter has never before been called a racist? In 2001, Coulter spoke at her alma mater, Cornell University, and was confronted with those very accusations. According to David Horowitz, “Even before her arrival, campus Democrats had already sent out a flyer calling on students to protest Coulter’s talk, while another flyer from the more ardent left aggressively linked her with Adolf Hitler and David Duke.” Those accusations of racism were neither the first nor the last levied against Coulter. Last year, Coulter was embroiled in numerous controversies of her own making. One revolved around her nativist denunciation of foreigners vis-à-vis soccer. Another centered on her defamation of Christian missionaries. Both incorporated racist views which Coulter again reaffirmed just this year. Coulter offers Americans a bait-and-switch in which she champions an idyllic WASP culture which must be restored for America to once again flourish but offers instead a white supremacist paradigm which is antithetical to the very culture she champions. America’s settlers and Founding Fathers created a new American culture distinct from, though similar to, Anglo-Saxon culture. People of all races and cultures have assimilated to – and enhanced – that foundational culture. None of these traits are racial. None of these characteristics are inherited. America’s Founding Fathers understood this. They understood that liberty, morality, virtue, godliness and the like all transcend race and ethnicity. Similarly, they grasped that the gospel – which imbued the life of colonial and early America – transcends all cultures and can impact the life of any person anywhere. They understood these things to the marrow of their bones. 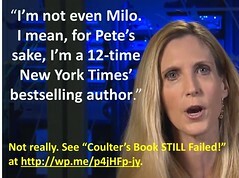 See “Coulter Trashes Principled Patriot, Promotes Corrupt Incumbent” at http://t.co/4yJQgFLSJr. Ann Coulter, “ISIS: 0, Ted Kennedy: Too Many to Count,” 7/8/15. Ohio Farmer, A Constitutional Conversation: Letters form an Ohio Farmer, Ashbrook Center, 2011, pp. 20-21. Dana Perino, Fox & Friends, FNC, 7/4/15. Michael J. Gerson, Heroic Conservatism: Why Republicans Need to Embrace America’s Ideals (And Why They Deserve to Fail If They Don’t), HarperOne, 2007, pg. 268. Michael J. Gerson, Heroic Conservatism: Why Republicans Need to Embrace America’s Ideals (And Why They Deserve to Fail If They Don’t), HarperOne, 2007, pg. 263. Michael J. Gerson, Heroic Conservatism: Why Republicans Need to Embrace America’s Ideals (And Why They Deserve to Fail If They Don’t), HarperOne, 2007, pp. 263-264. Michael J. Gerson, Heroic Conservatism: Why Republicans Need to Embrace America’s Ideals (And Why They Deserve to Fail If They Don’t), HarperOne, 2007, pg. 264. Ann Coulter, National Press Club, 6/17/15. Ann Coulter, Laura Ingraham Show, 6/18/15. Very well written piece and well researched. All of which misses the truth of history: America was functional as a WASP nation, but never since. The point is that – for months – Coulter has claimed that there is NO threat from ISIS (or other Islamic terrorist groups), when that is simply not true. In fact, terrorism in America has been on the rise since Obama took office. Consider this recent headline: “There Have Been More Jihadist Terror Cases in U.S. in 2015 Than in Any Year Since 9/11″ at http://www.cnsnews.com/news/article/michael-w-chapman/homeland-security-cmte-more-us-based-jihadist-terror-cases-2015-any. Been a while since I read something that stupid and off the mark. All the hate directed at Coulter is wrong. You misconstrue criticism for hatred. It is Coulter who exhibits and expresses hatred. Indeed, she is proud of her enmity for others. She is actually a champion of black America. She rightly makes the point that the immigrants are making it at the expense of American blacks. You are correct that Coulter is right about the impact that immigration has upon the black community. However, her comments are often racist because she herself views non-whites (especially non-WASPs) as inferior to herself. Her emphasis throughout her book tour highlighted race more than culture. She constantly states the reason why Americans are sensitive on race is because of slavery and Jim Crow,her point is that positive action is for those people not the ones who turned up yesterday. You will also notice she treats black people the same as everyone else,none of this liberal deference this is because she thinks them equal. When a liberal meets a black they first check their valuables and then treat them like children. Coulter is simply wrong! “Civil rights” are not “just for blacks.” The reason people are so sensitive about race is not because of slavery. It is because of race-mongers like Jackson and Sharpton who use lies and racial myths to incite riots create division. 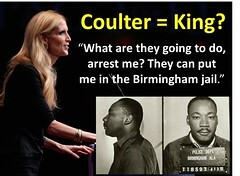 As for Coulter treating blacks equally, yes, she offends them equally as well, including using racial slurs. See chapter 4, “Prejudice,” Vanity: Ann Coulter’s Quest for Glory, available as a free download at http://www.coulterwatch.com/vanity.odf. I stumbled on this site so hope you don’t mind me asking a question. Is this site solely to counter Coulters arguments ? I’ve just read Adios America ( I thought it was good ) and have been following up on Coulter since. She seems to me a fascinating character. I’m Irish born and bred.